Finally! Enough Model 3 owners have gotten through the hassle of keeping ABRP running in a mobile browser while driving and charging to give ABRP some initial consumption and driving statistics. Have you noticed how much better ABRP has become in the mobile browser with the latest UI updates, BTW? We have data points from 57 Model 3s, but most vehicles have only provided a couple of seconds of data.  Most of the data actually comes from a Swedish American cross-east-cost driver who left ABRP running often enough in the phone – great thanks Pontus! The total Model 3 distance driven with ABRP running is only so far 1200 km, consuming 187 kWh, so more data is definitively needed. However, the data we have is pretty consistent and therefore we choose to publish it here. Let’s dive into data. Here goes the standard power-vs-speed chart that we rely on a lot at ABRP. 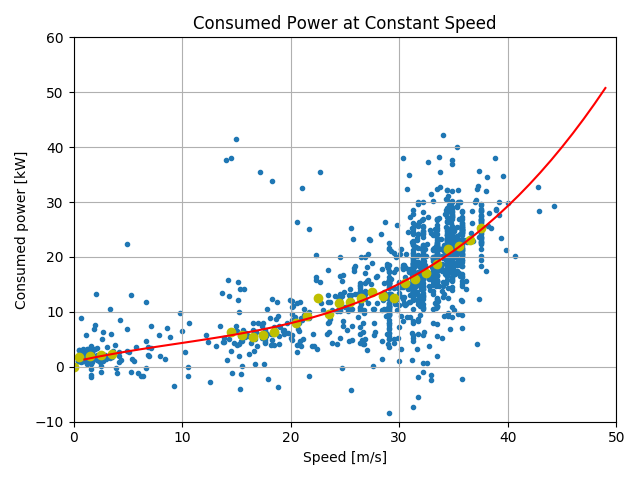 This is data corresponding to driving at a constant speed on flat land. Elevation and speed changes are then added on top by ABRP when planning routes. That is very very good and a lot of credit has to be given to Tesla for working so hard on efficiency even at high highway speeds. While consumption while driving is very important for a good long trip experience with an EV, this is equally true for charging. Tesla’s supercharger network is fantastic, and one of the most important factors in making a Tesla the only vehicle you need. The Tesla supercharger can currently deliver up to 120 kW to one vehicle, but that is not the only limitation – the battery itself limits the power depending on its current State-of-Charge (SoC), i.e. battery %. It basically takes as much power as the S/X 100D BTX6 battery at the same SoC %, but with a smaller battery capacity. 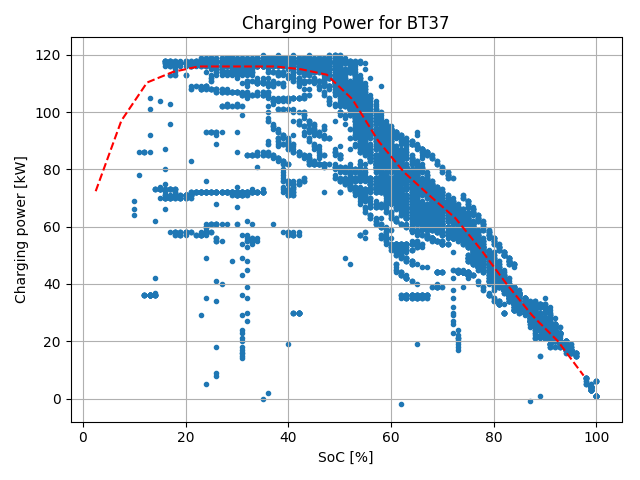 The estimated usable capacity of the BT37 battery from this data is 73.4 kWh. 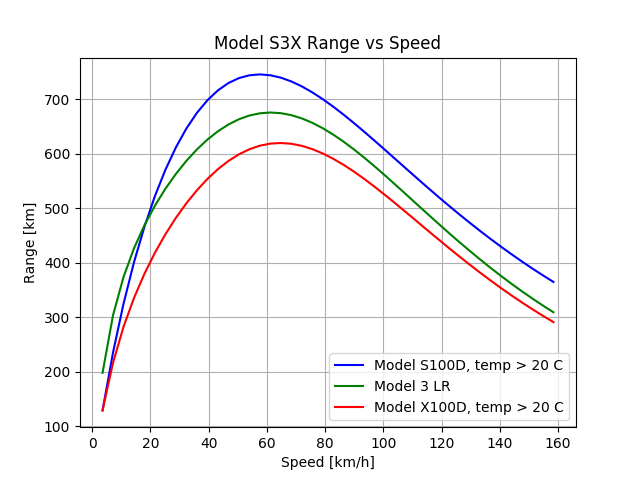 In an attempt to compare the characteristics of all of Tesla’s present models we have plotted the consumption and range of a Model S100D, Model 3 Long Range and Model X100D based on ABRPs models – in turn based on all generously donated data. 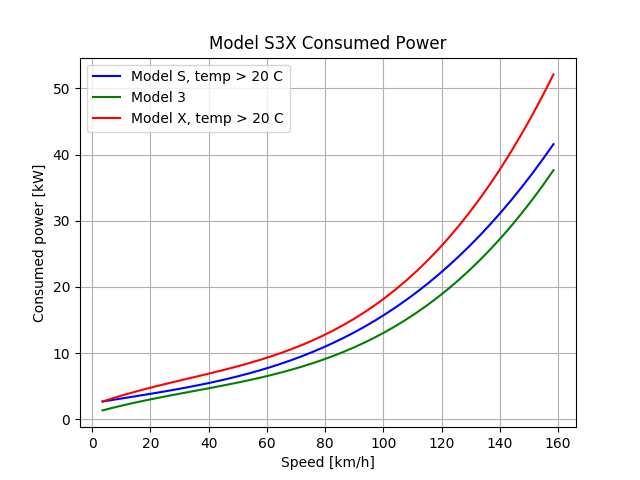 The data speaks for itself; X is obviously the most power hungry vehicle of the three, and the consumption model indicates that its is particularly bad at high speeds – but that is hardly a surprise given the sheer size of the X. Model 3 is indeed impressively effective. One more thing. The combination of low power consumption and high charging speed gives the Model 3 Long Range a unique position in the perhaps most interesting challenge: Shortest road trip time. I have to apologize for not contributing enough data. I thought that the 24 hour background data access would allow ABRP to collect information from our vehicle even without ABRP actively running. This appears to not be the case, since if it worked, you'd have at least 5,000 more miles of data. I'm going to stick an old iPhone in the car specifically for the purpose of running ABRP... lots of road trips coming up between now and the end of the year. 1.) If I leave ARBP running in a browser on my home computer while I'm out running around in the car, will you be able to gather meaningful data? 2.) Does real-time navigation need to be turned on? 3.) Is the data more meaningful if the vehicle is following a planned route? 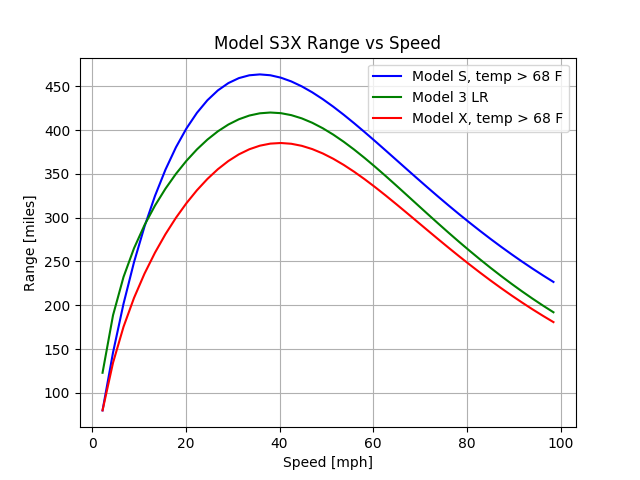 Would be great to distinguish M3 LR and M3 LRD (dual motor) in the calculations and graphs (once you have enough data to so so) as dual motor lowers efficiency on the M3, all other things being equal (wheel diameter, aero covers, etc). nextmoves Model3 LR in Germany drove on autopilot 1001km at 20-30km/h. That doesn't match with data Model3 range vs. Speed. Could you do a direct efficiency comparison between the Ioniq versus the Tesla Model 3 long range? That was a challenge under ideal cirumstances, Increased tire preassure on low rolling resistance tires, no heating, no AC, no seatheaters, no lights etc. The above is real life data, which is also why cosumptions vary so much at the same speed if you look at the first graph.